People choose tile floors especially for kitchen and bathroom or another place of the house where getting chances to get wet time to time. Yes, it’s true that if you clean your white tile floor daily basis, then your tile floor will look shiny and versatile. But there are another advantages that your maintenance cost will come down. Sometimes the process of clean-up tile floors quite burdensome and time taking. 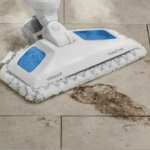 so here I am to reduce your strain and giving you the best technique on how to clean white tile floors that you can easily clean your tile floors and grouts without any hassle. My technique not only appropriate for white ceramic tile but also faux tile floors. At first sweep or vacuum the room. When you clean your dirt, pet hair or small solid particle, then you can use your chemical or cleaning liquid on the tile floor. Dust or little piece of debris that is allowed to mix in the wet surface can easily turn into difficult-to remove grime. Try to use best cleaning chemical for a mop. 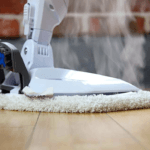 Use a dry cloth machine or dry mop after finishing your mop. 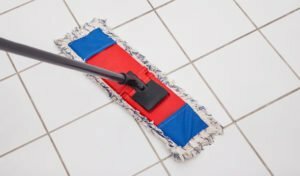 By using homemade cleaning technique, you can easily clean-up your kitchen or every other floor tile room easily. First, you have to use boil water, and white vinegar (or baking soda) then Pour 1 cup of vinegar in 2 cups of hot water and shake it well after doing this collect a soft, dry and clean mop and soak it in this mixture. 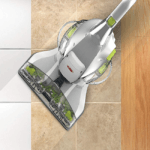 Use the mop for scrubbing tile floors, every single corner of the floor. Furthermore, collect a spray bottle and pour vinegar-water mixture into spray bottles and spray the mixture on the tile floor. Use micro fiber mop for cleaning your tiles floor because micro fiber mop is very useful for tile floors. Pour 1 cup of vinegar in 2 cups of hot water and shake it- mixture complete. 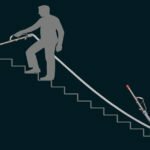 Use the mop for scrubbing tile floors. If you arrange a party in your home, then there is a chance to drop a glass of juice or wine from the hand on the tile floors. Don’t feel panic just clean it quickly because dried juice or alcohol is very much sticky. If you are a pet lover and your dog drops a raw meat on the floor do clean-up this dirt as soon as possible as well. If you drop a glass of juice or alcohol on the tiles floor clean it up quickly. Mixing diatomaceous earth poultice with commercial cleaning chemical which is available on the market. This ingredient comes in the form of moist looking clay. Pour the mixture on the surface of the tile, put slight force above it and let it sit on the floor tiles, for a couple of minutes. Cover the mix with a clear plastic sheet to keep it moist for a long time. Take away it to expose white, glistening floor tiles. Use diatomaceous earth poultice with commercial cleaning chemical to make your white tile floor more shining. Try to find out best cleaning liquid from the market. Many of them on the market but personally I can recommend you this three cleaning liquid Lysol, Pine-Sol, and Mr. Clean. 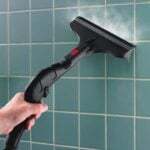 Buy it and clean your white tile floor easily. Select best cleaning liquid mixture from the market. We describe you a quick solution on how to clean white tile floors. If you find it helpful, then share it and don’t forget to give your thoughts on the comment below.